There’s a bit of a back story to the Lukka Bar Restaurant & Cafe scenario, so we guess we should start there, really. 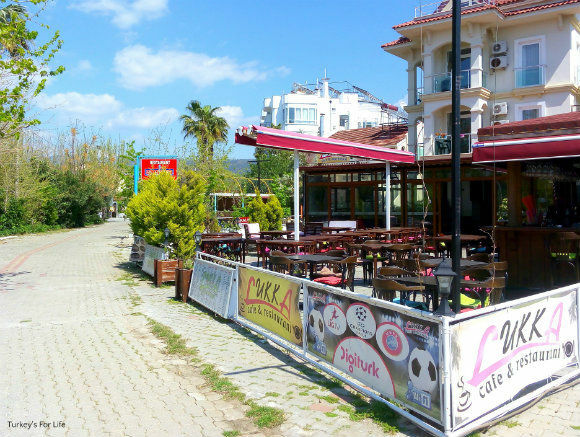 You see, Lukka is this bar/restaurant that’s been there, sat at the end of the main stretch of Çalış Beach for quite some time. Five years, actually, when we asked owner, Aydın, recently. Five years this place has been there…13 years we’ve been living in Fethiye…and we’d never stepped foot over the threshold of Lukka Bar, Cafe & Restaurant. Maybe we’re the last little hangers-on of that ‘local pub’ generation. Where both me and Barry grew up in our respective parts of Wigan, you had your local pubs. So, when we finally moved in to our house together in a different part of Wigan, we had our local pub, The Owl Inn. There was one pub just as close as The Owl and a good few others just a few minutes’ stroll away. VERY rare were the times we strayed to other pubs in the locality. No logic or reason to this; you just had your place and that was it. Maybe that’s why we have certain (illogical) blocks on going to some places. I mean, it’s not like we didn’t know Lukka Bar Cafe & Restaurant existed. We’ve always seen it as we walked by, en route elsewhere. Usually to catch the dolmuş at the end of the walkway you can see in the photo above. And then, a couple of years ago, we met up with one of the admins of the Fethiyespor1933 Facebook page at Cafe Park Teras in Fethiye. He came along with a friend who introduced him. Do you now know Lukka, he asked. Ahh, yeah, we’ve seen Lukka, we said. This is his brother. Ahhh, right. And by and by, we got to know ‘brother’ a bit better. Lovely guy. Saw him at Fethiyespor matches all the time – sometimes a quick wave and sometimes a quick chat…and all the time, me and Barry doing afterthoughts aloud of eek-we-really-ought-to-go-to-Lukka-sometime. Not only did we know it was good manners and would be appreciated, we were genuinely becoming a tad more curious as different friends mentioned it. 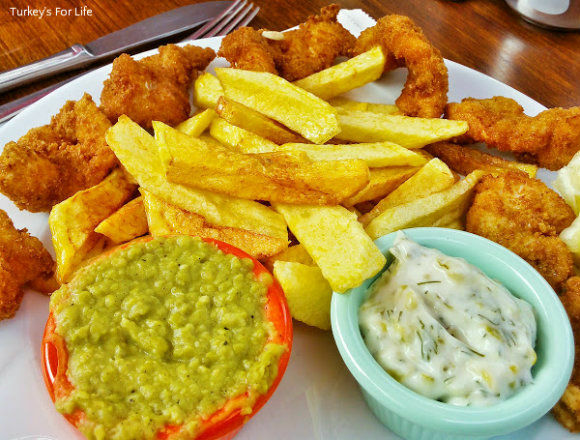 “They do a great scampi and chips at Lukka Cafe Bar & Restaurant,” said a friend who isn’t generally known for her gushings of eateries. “Eww, bet it’s processed beige stuff,” we suggested. Well, who’s gonna serve scampi in this corner of Turkey? And so we did…and you know those situations where go from never having been to somewhere before and then you find yourself becoming a bit of a regular. Yeah, that’s what’s kinda happened. We took Barry’s mum there and, as with Çalış Kebabs & Dürüm and Denizatı Restaurant, it got her seal of approval, too. And she’s been back again with us, since. High praise indeed! Scampi for her. Eight real jumbo king prawns in a crispy coating. 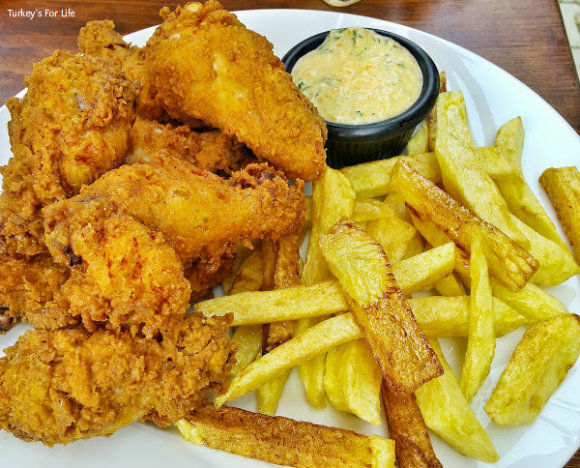 After speaking to other people we know who are already seasoned pros when it comes to Lukka’s menu, the famous LFC (Lukka Fried Chicken) was highly recommended. Barry plumped for that option on another visit…and I nicked a couple of pieces, too. Meaty chicken drummers in a super-crispy coating, real chips (that’s gotta beat a famous fast food joint every time) and a carrot and yoghurt dip. They also do a very nice Chicken Schnitzel too. My dad loves simple comfort foods like this, and now, as well as keeping him happy with barbecuing at Cin Bal and a drive to the mountains to Kırkpınar Restaurant, we know we can feed him up nearby at the end of Çalış Beach, too. Lukka Cafe & Restaurant will suit him perfectly! 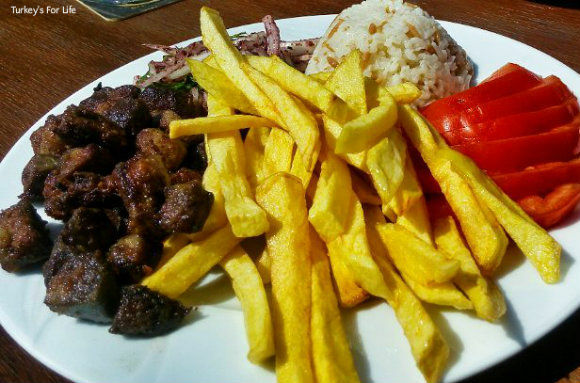 Now, lest you go thinking everything at Lukka is something in a crispy coating served with chips, there are, of course, Turkish options (and lots of other snacks, salads and sides on the menu, too). In an effort not to just sit and eat the Lukka scampi and chips all the time (it is good), I’ve forced my eyes to other areas of the menu. I’m a sucker for a Turkish güveç dish (aka the Turkish casserole). After scanning the options at our last visit, I spotted the karides güveç (shrimp casserole) and couldn’t help but wonder if they’d be big fat king prawns, like the ones used for the scampi. Ohhh, yes, they’re definitely big fat king prawns. Not a little tiny shrimp in sight. And I’m kicking myself a bit for this photo. We love Arnavut Ciğeri (Albanian liver), especially when it’s served – as is the norm – with a side of shredded onion and parsley and tossed in oodles of zesty flavoured sumac. This little salad is on this dish and had oodles of sumac…it just looks a bit obscured. Anyway, it’s there. A perfect match to the flash-fried liver pieces. Crisp on the outside, soft and juicy on the inside, just as Arnavut ciğeri should be. And that’s about it, really. We’re relative newbies to this place, and so far, it’s just been lunches in the late winter / early spring sunshine (it takes us a while to get around to writing about places we’ve been). All the food we’ve ordered has been cooked by Aydın’s wife. And, on our last visit, there was an extra waiter, too. Good job as it was busy! Whether more staff pop up as the summer season kicks in, we shall see. 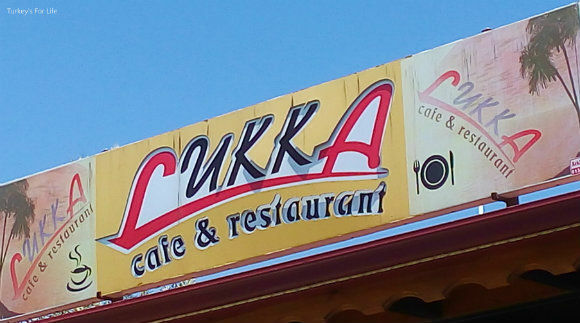 Lukka Cafe & Restaurant is at the end of the main stretch of Çalış Beach, close to Hotel Seril. Lukka is open year round and there is an open fire inside for the colder winter months. There’s also a few tables with comfortable armchairs for those who like to relax a tad. A variety of sports is shown on the big screens inside and there’s also a pool table and darts board. Food at Lukka Cafe & Restaurant is reasonably priced and home cooked. A range of breakfasts, snacks and main meals are all available. According to historians, ‘Lukka’ means ‘Land of the Lights,’ referring to Lycian Turkey. We’ve added Lukka Cafe & Restaurant to the Çalış Beach section of our suggestions of where to eat and drink around Fethiye. 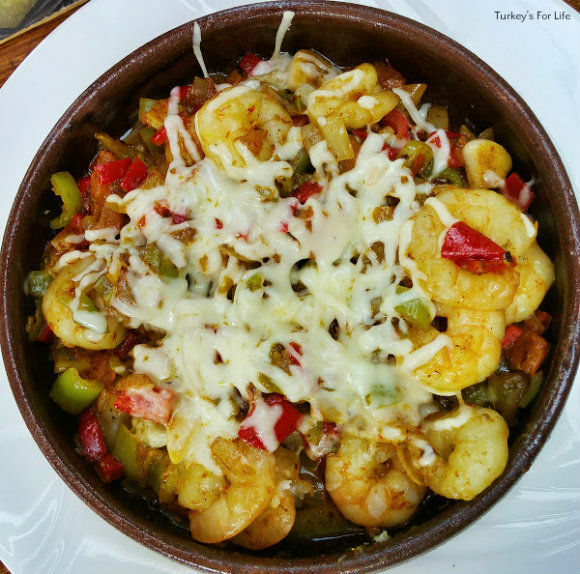 I have never had scampi – time to head down to Fethiye. Wow, BacktoBodrum, you have genuinely shocked us there. If you’re from our area of the the UK, just about any meal you went out for as a kid, you ‘treated yourself’ to scampi. 🙂 So good to see it at Lukka in the form of breaded king prawns. 🙂 A blast from the past for us and welcome, too. Thanks a lot Linda and yes, the food at Lukka Bar is really good. We’ll be back there again, soon. 🙂 Greetings from Turkey.